Alrighty! I’m so excited. Let’s start with supplies. I broke this down into four sections, ranging from easiest to . . . not easiest. Not that any of this is even hard! But it’s just more detailed. More steps. More luxurious awesomeness. These candles are by far the easiest you’ll ever make in the history of your life here on earth. You buy the sheets in a box. They come with a loooong strand of wick. 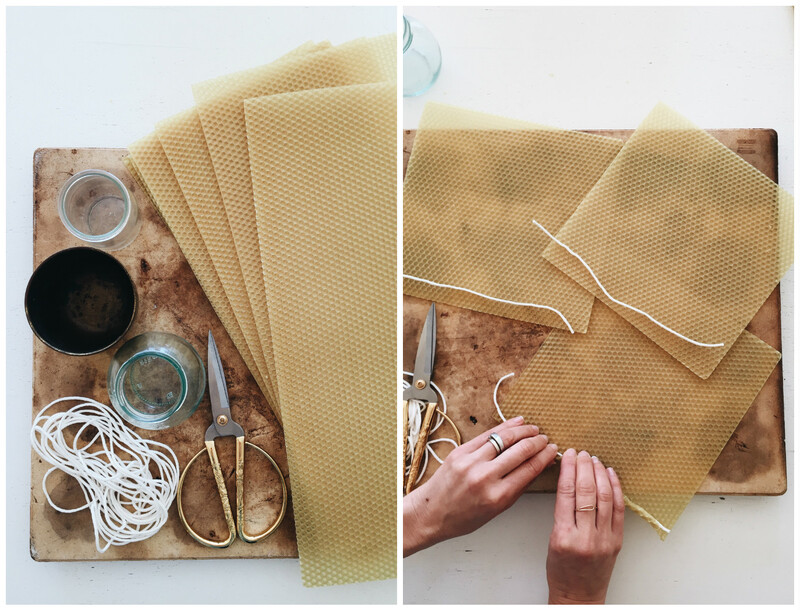 You’ll cut each long beeswax sheet in half. You measure and cut the wick to fit each sheet, leaving a little extra dangling out to burn. You might think the sheet will break easily, but once you get them in your hands, you’ll see how pliable they actually are. Gently yet tightly wrap the end of the beeswax sheet around the wick, and keep rolling rolling rolling, until it’s a dang candle. Takes like 15 seconds. 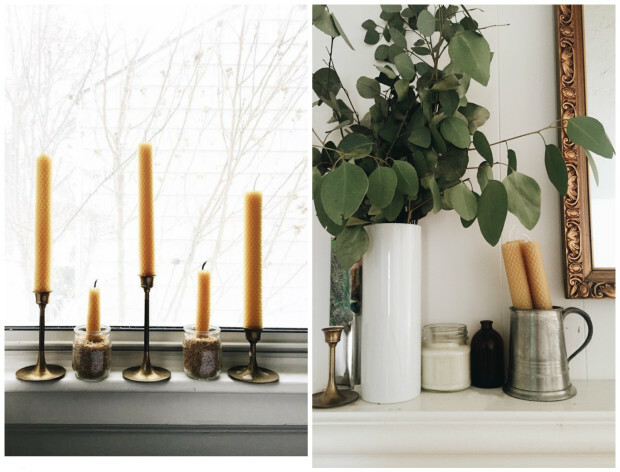 Make sure you keep the rolling even, so your candle isn’t wonky and twisted. You’ll trim the wicks and boom – done. I like to put mine in little leftover mousse jars from this French bakery down the street. Anchor it with rice to keep it in place. GAWGEOUS. Plus – this mustard color is so easy on the eyes. It goes with anything. They burn fast, so make a ton! Okay, I have to tell you about this book I was recently recommended and bought. 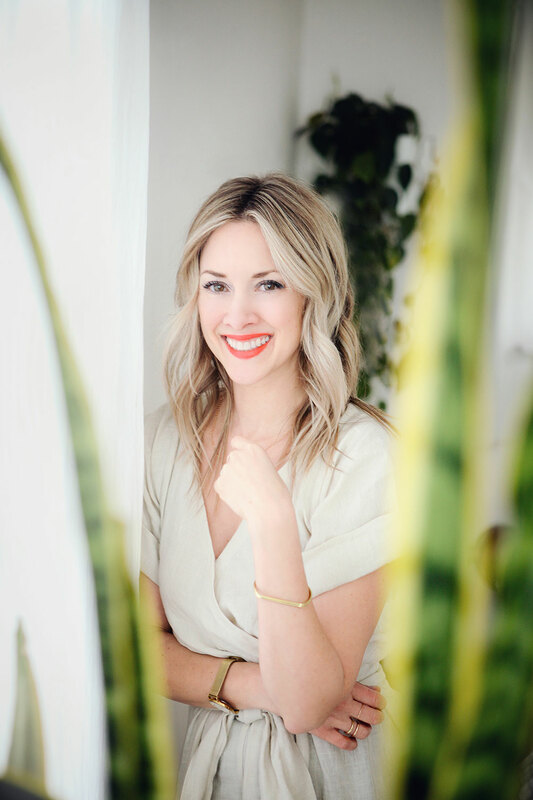 It’s called The Green Beauty Guide, and it is changing my life. It’s all about how to pay attention to all of these horrible added ingredients in our beauty products. AND how to make your own. It’s incredible. Overwhelming, but incredible. This solid perfume is a version of what’s in the book! I changed the carrier oil and my scents, but the measurements are the same. 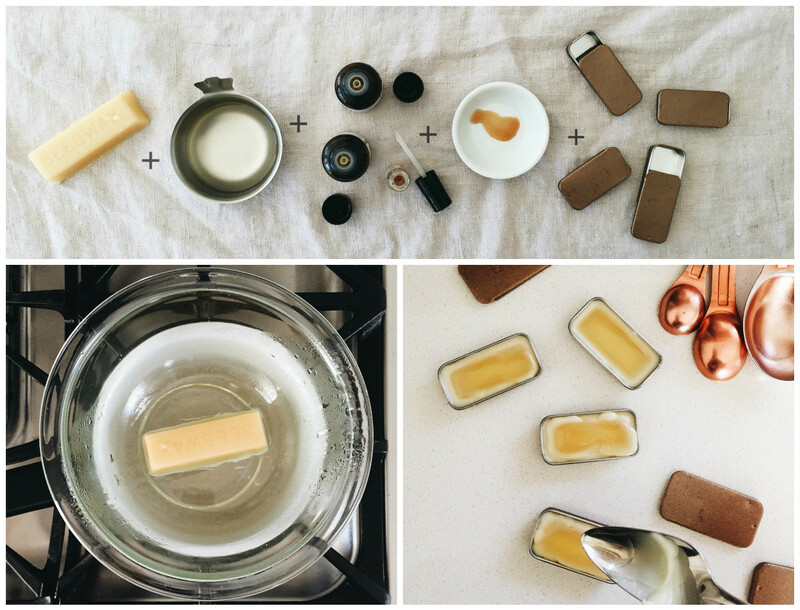 You’ll take an ounce of beeswax (the bar works best here) and melt it with 2 Tbs. sweet almond oil. (Jojoba works here as well.) When I say melt, I mean in a heat-safe glass bowl over simmering water. I’m basically mimicking a double boiler. Melt the wax and oil until the wax is completely dissolved, then take it off the heat. Add 10 drops peppermint essential oil, 10 drops rosewater oil, and 10 drops lavender essential oil. Also add 2 tiny drops of vanilla extract. Stir until combined. Then you’ll spoon the hot substance into little slide lip balm containers, an old pillbox, anything you want to use as your perfume holder! Cute, right? Ignore that one janky pour right up there in the middle. ^^ This will harden pretty immediately, and you’re ready to use! Just rub rub rub, dab dab dab. This has been my FAVORITE recipe/project since early January. 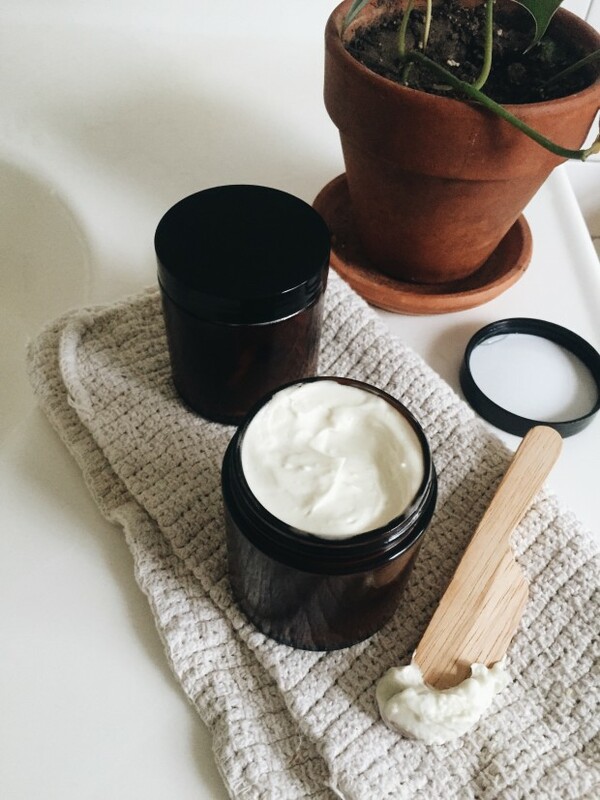 There is nothing – nothing like a homemade body butter. My girl gave me a Rosemary Citrus butter for Christmas (along with a basic rundown of the recipe). But since then I’ve been tweaking and playing, and I cannot get enough of how soft and silky and luxurious this butter feels. TRUST MEH. In your heat-safe glass bowl over simmering water, you’ll melt 3/4 cup of shea butter, 1/4 cup coconut oil and 1 Tbs. beeswax pellets. Keep stirring and get it all good and melted together. Take it off the heat and pour it into little mason jars. (I used half-pint jars) Add 20 drops of grapefruit essential oil, and 20 drops eucalyptus oil. Gently stir, and put the lid on. Let it sit over night, until it’s cooled and solidified. It won’t be solid like the perfume! But a creamy, smooth, buttery goodness that you’ll want to forever live in. Other versions I’ve made: peppermint and cedarwood (omg), lavender and patchouli (holy cow) and then this one (dear Lord). It’s so wonderful and perfect and I can’t talk about it a second longer or else I’ll bawl. I MADE A FACE CREAM. A whipped, glorious, real-deal facial moisturizer and I am all but losing my mind. I researched this one like crazy. 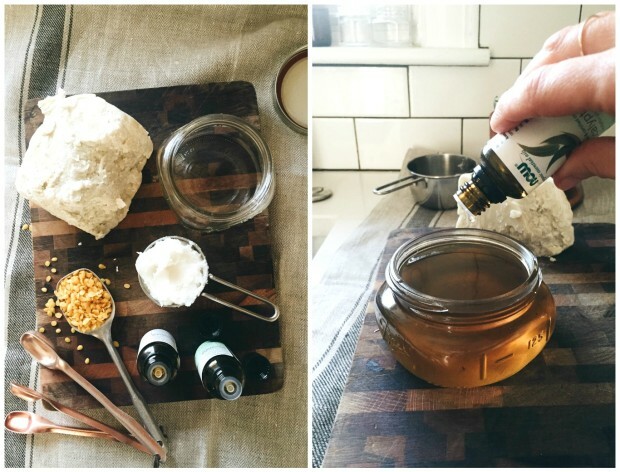 There are 20347823425324 kazillion recipes and versions of how to make a DIY cream. And it’s like, everything was so different yet so similar. It gave me gas. 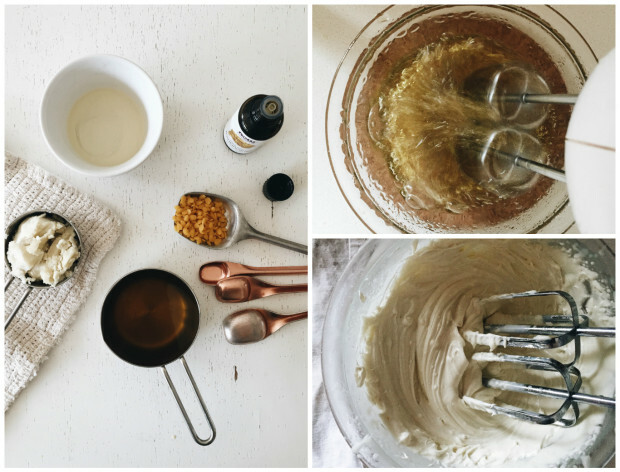 So, I combined ideas from a handful, and created my own freaking face cream recipe. And it’s simple! And actually works! Now, this is where we take things up a notch. Start blending the hot oil with a hand mixer, until you see little bubbles start to form. Be patient, because this takes a good 5 or 6 minutes. THEN, stick the bowl in the freezer for 15 minutes. After 15, grab the bowl and start mixing again. It will quickly become creamy, but not exactly whipped. And we want whipped. We want to whip it real good. Add 1/2 Tbs. distilled water and mix for a few more minutes. Then, stick the bowl BACK in the freezer for five more minutes. After five, you’ll notice a huge difference. Stick the mixer back in and whip that baby up. You may even get teary. It happens. This recipe makes about a cup and a half, so store any leftovers in the fridge until you’ve run out of your first batch. And there we have it! 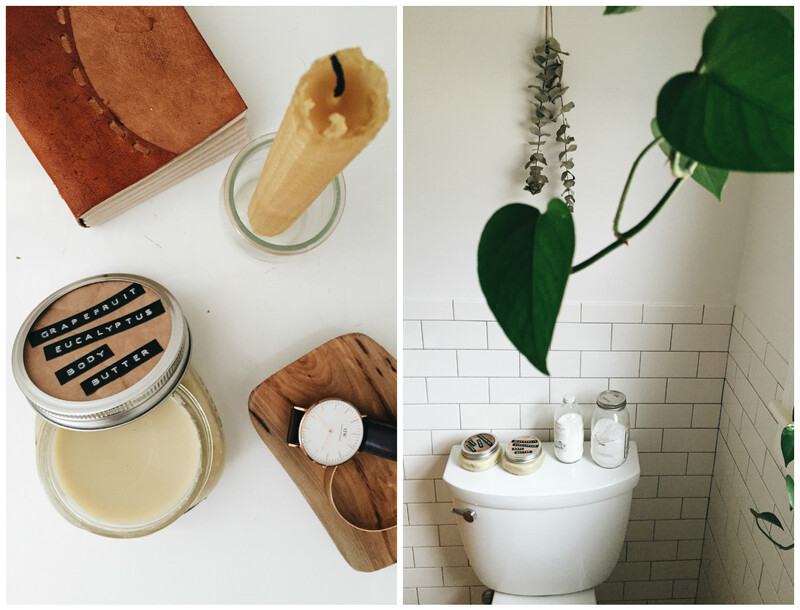 Candles, a solid perfume, body butters o’ glory, and a face cream that will have you seeing the THIRD DIMENSION. I really do hope you make one or all of these recipes! And you have to come back to tell me how they turned out, duh. Okay, it’s your turn. If you have any beeswax recipes, whether it be beauty, household, whatevs, hook it up! Because obviously I need yet another obsession. This weekend I decided it was time to get crunchy and make lotion for my babies. Then I saw you tease this post on snapchat and have since been eagerly waiting these recipes. I'm sensitive to smells so I'll probably leave out essential oils unless you think that'll change the recipe too much. Going fragrance free is just fine! Besides the perfume. It would defeat the purpose, but everything yes - yeah! Love these! Totally going to have to try that face cream this weekend.. looks so luscious. and it's so wild that nearly all that stuff's been in my pantry for months and here I am slathering bottled chemicals on my face daily. So excited! These recipes sound amazing!! I want to try the face cream first because it sounds luxurious and the face lotion I'm using right now stinks. Like, literally stinks. As in my husband asks me if I really like it because it stinks. But I'm actually just trying to use it up so I can FINALLY throw it away. ? So yes. Face cream. On my list. Along with your chicken suiza. ? This is such a cool post! You're so resourceful and I'm amazed how you use beeswax in so many different ways! I am sensitive to heavy fragrance and perfumes so will have to the body products! Great post! Any suggestions on where to buy the carrier and essential oils? So, the Insane Face Cream is, indeed, insanely good! Just made it and used it today. Two questions for you ... 1. should it be stored in the fridge or at room temperature? And also, 2. how do you keep your littles from wanting to "lick the beaters"? My kids were this close to ingesting the "icing" that Mama was making! 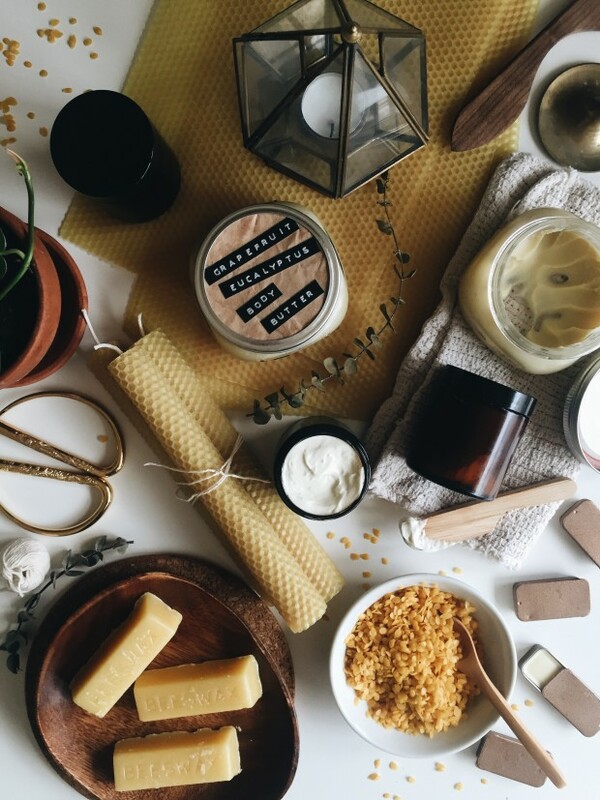 Here's a good beeswax recipe for a lotion bar. I use this in the winter a lot. It's pretty solid but will warm up quickly once it hits your skin. 1/4 cup coconut oil, 1/4 shea butter, 1/4 cup beeswax + 1 tsp vitamin E oil. Melt and pour into an empty deodorant container. Also, it's like an enormous lip balm! i know NOOOTHING about making face cream...however my current face cream [I THINK] is making me break out...do you have sensitive skin?? I am sensitive to like all things on my skin it seems...not natural stuff tho...so I think this is probably okay, but just curious :) I may just try it either way since you set all these lovely recipes up for us and im obsessed with bee-things. any chance you can attach the links you used on amazon. I have never bought any essential oils or beeswax and there seem to be soooooo many choices, I am a bit overwhelmed by all the choices and afraid I am will buy the wrong things. I know you are busy and it might be a bit of a pain. If you could, that would be great! thanks so much. will get investigating!!! What brand of Shea butter do you purchase? Is it un-refined? Really want to try the body butter! 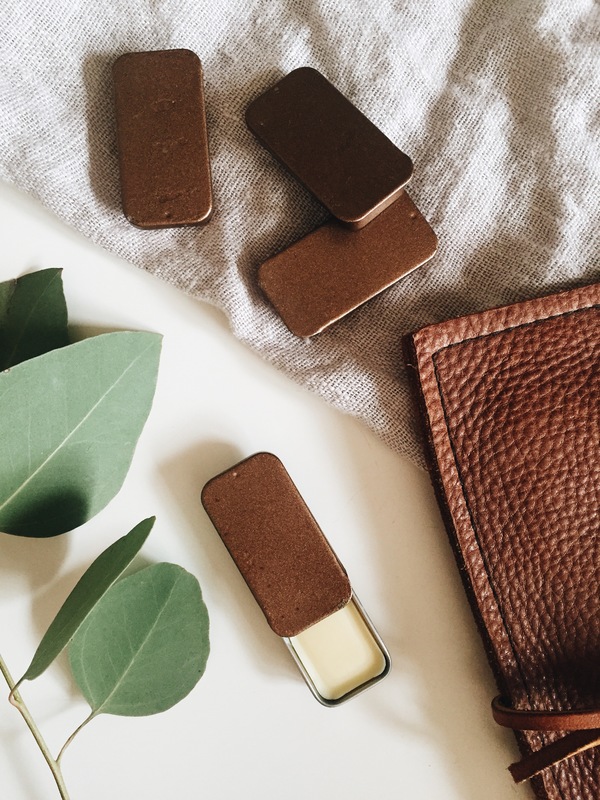 I would love to make these as gifts for the ladies in my family and I was wondering/hoping you could tell me where you got your cute jars and lip balm tins from? Thanks!? Sort of off-topic, but I mix perfume and face serum together in little rollerball bottles and use that in my purse for a quick scent refresher. I do it on the cheap, too, by using those little sample vials of perfume and samples of serum. I never used those things, just threw them away until I thought of doing this. The serum makes the scent stick better than just a spritz on your skin. Just a little roll, like over and inch of skin, and you have a nice mild but long-lasting scent. Does this work well with oily skin? My face is oily so I usually don't use face moisturizer often because to keep it from being overly oily.